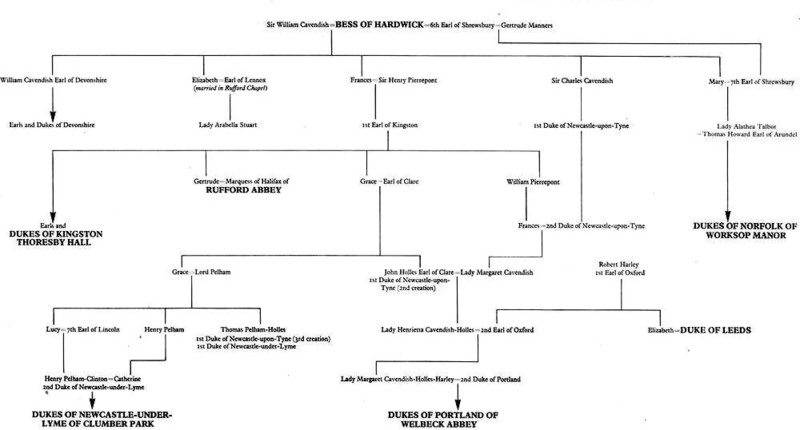 The connection with Holme Pierrepont and Bess of Hardwick goes back to when her eldest daughter Frances married Sir Henry Pierrepont. Henry and Frances lived at Holme Pierrepont. Frances Pierrepont (née Cavendish; b. 1548) was Bess's eldest child from her second marriage, to Sir William Cavendish (1508-57). She is first mentioned in letters written by Bess as a young girl, when her mother, who calls her 'franke', tells her to practise her virginal (ID 101). In 1562 she married Henry Pierrepont and they resided at Holme Pierrepont Hall, outside Nottingham. Among their five children were Robert, Earl of Kingston (later Dukes of Kingston and Earl Manvers) and Elizabeth (b. 1567; known as Bessie) who aged four became attendant to the Scots Queen and later married Richard Stapleton. In her will, Bess left Frances a precious book, commissioned during her marriage to Cavendish, set with gold, stones and portraits of herself and Frances’s father.